By bringing in outside talent to couple with emerging homegrown stars like Aaron Nola and Rhys Hoskins, the Phillies made strides in 2018 toward regaining relevancy in the National League East under new manager Gabe Kapler. While a slide at the end of the season marred what began as a nice turnaround, the Phillies appear primed to challenge for the division in the near future. With plenty of prospects on the rise in a system that boasted a .539 overall winning percentage and four different playoff affiliates in 2018, the club is poised to build on this momentum. In his first full year in Double-A, Grullon did more than improve against better competition -- he put together a career year. The 22-year-old backstop posted career highs with 21 homers (also a team best) and 59 RBIs in his sixth year as a pro. Named both a midseason and postseason All-Star, Grullon nabbed the Eastern League All-Star Home Run Derby crown with an impressive showing in Trenton. Grullon pulled the ball less in 2018 (43.7 vs. 58.5 percent in 2017, per FanGraphs), using more of the field to his advantage. He also gave Reading plenty of stability behind the plate this season, catching in 87 of his 90 contests and throwing out 33 percent of would-be basestealers. "We're excited about the progress he's made," Phillies assistant general manager Bryan Minniti said. "He has a lot of tools defensively and offensively and we're excited to see where it takes him. ... Anytime you have somebody who has the ability to catch, you play it out as long as you can. He's given us no indication of not being able to handle it." One season after bashing 29 homers, Hall followed up with another powerful campaign, belting an organization-best 26 roundtrippers between the Florida State and Eastern leagues. The 23-year-old pushed his way through Clearwater with 11 homers and a .904 OPS in 48 games -- earning an FSL All-Star nod -- before being promoted to Reading on June 1. There, he clobbered 15 more dingers, finishing with a .784 OPS between the two circuits. A 14th-round pick out of Dallas Baptist University, Hall now has 64 homers in his first three professional seasons. As a 20-year-old in his second full season in the Minor Leagues, the No. 12 Phillies prospect made improvements in all facets of his game. He flashed a bit more with the bat, collecting 26 extra-base hits while improving his average by 13 points. However, it was the defensive side where Brito truly made his mark in 2018, holding a .988 fielding percentage (the best mark among second basemen in the Minors) and turning 78 double plays. His stand out play earned him an MiLB Gold Glove for the season. "His defense has always been very good -- he just won a Gold Glove," Minniti said. "He just continues to make progress offensively and we're excited to see where things go. He had a nice finish to the year and we're excited to see him take off next year." In his seventh season in the Phillies system, Green undoubtedly had his best performance at the plate. The 24-year-old set career highs with 20 homers and 75 RBIs with a .281/.356/.532 line across the Minors' two highest levels. The 2012 third-round pick went deep 17 times in the first half to earn a spot on the Eastern League All-Star squad. In the final 37 games of the year with the IronPigs, Green hit .248/.312/.432 to help Lehigh Valley reach the postseason. Maton made the jump to full-season ball in 2018 and didn't miss a beat for Class A Lakewood. A South Atlantic League All-Star, Maton pieced together a .256/.330/.404 line with eight homers (and 39 total extra-base hits) while driving in 51 runs. Though his bat cooled off in the second half of the season, Maton impressed in the first half with a .266 average and five dingers. Playing 110 games at shortstop, the 6-foot-2 middle infielder used his athleticism to hold down a .966 fielding percentage. "He's a little bit under the radar in terms of people don't know who he is going in," Minniti said. "He had a nice year at the plate and he plays better at shortstop than you probably think when you see him -- he's a big fella and a good athlete. He had a nice year on both sides of the ball for us." The No. 8 overall pick in the 2017 Draft out of the University of Virginia tore through the system in his first full season. Starting the year in the FSL, Haseley hit .300/.343/.415 with the Threshers before a promotion to Double-A in the second half. Facing better pitching in the Eastern League, Haseley rose to the challenge and improved upon his A Advanced numbers, albeit in a smaller sample. The 22-year-old, currently ranked as the No. 4 prospect in the system, batted .316 with an .880 OPS during the final 37 games of the season with Reading. "First full season in professional baseball and you finish the year really swinging it well in Double-A, that's not easy to do," Minniti said. "He had a nice year for us at both levels. He showed the ability to make adjustments. To do what he did in his first full season is tough. "He's a year removed from playing in the ACC and he's effectively two levels from the big leagues, but he's also at a level where guys get called right to the big leagues. It's not that easy to do. For whatever reason he didn't have a ton of hype during the season, even being a first-round pick. He's a good looking player and we're excited about his future." A perennial Joe Bauman Award contender, Cozens didn't quite come up with the Minor League home run title in 2018, but he remained a legitimate power threat. For the third straight season, the 24-year-old belted at least 20 home runs (this time 21) to go with a .529 slugging percentage. The slugger also earned his first cup of coffee in the Majors, spending 26 games with Philadelphia and crushing his first big league dinger. "The biggest challenge with guys like that is getting them at-bats consistently. Guys who need to play every day but also be your best bat off the bench in the big leagues -- that's the challenge all teams deal with," Minniti said. "That's one of the issues with him -- he needs to be consistent as a player. He's a fantastic player and very talented." After hitting .194 in the FSL in 2017, Pujols turned things around -- and then some -- in 2018. Over 95 games with the Threshers, the outfielder hit .301/.364/.364/.523 with a team-best 18 long balls and 58 RBIs. The performance earned him the circuit's Player of the Year award and a trip up to Reading at the end of the season. He did whiff 162 times, but he also more than doubled his walk total to 47. "Maturing as a player, maturing as a hitter [made him better]," Minniti said. "Another guy who put in a lot of hard work with our player development staff. He bought in and really took steps forward. He'll still strike out for you, but the rest of his game was more well-rounded than it had been and he's definitely on the right track." Listi provided value at four different positions and while standing in the batter's box. A 17th-round selection in 2017, he saw time at first and third base as well as both corner outfield positions and hit .312/.412/.502 with 18 home runs while finishing second in the organization with 84 RBIs. He mashed with Clearwater in particular, compiling a .344 average with a 1.013 OPS -- and earning an FSL All-Star nod -- before moving on to the Eastern League. With such a strong showing in his second year out of Dallas Baptist, the organization sent Listi to the Arizona Fall League to continue his progress. "I don't think there's anything not to like," Minniti said. "He'll continue to try to get as well-rounded as he can as a player. To do what he did and -- he did a nice job out there in the Fall League as well -- is pretty remarkable. I think something we try to stress is that it doesn't matter where you're selected or where you're coming from. You get an opportunity to develop and you get an opportunity to play and you're going to be able to write your own ticket, and I think he's done that so far." Acquired in the offseason for infielder Freddy Galvis, De Los Santos made a big impact in his first season with the club. The flamethrowing right-hander and his 60-grade fastball started the year in Triple-A, where he posted a 10-5 record with a 2.63 ERA (his best full-season mark). In 13 of his 22 starts in the Minors this year, the 22-year-old tossed at least six innings and five times pitched seven or more. He earned himself a short stint in the Majors, picking up his first big league win on July 10 against the Mets after allowing three runs in 6 1/3 innings. Given De Los Santos' live fastball and developing off-speed offerings, the Phillies have plenty to look forward to from their No. 9 prospect. "He's an easy guy to get excited about," Minniti said. "He's got a great fastball and his breaking ball is still developing. I think the secondary stuff is going to dictate his role and success in the future. But so far he has an ability to mostly throw strikes and go after guys." Unranked at the start of the season, Parkinson became one of the year's best stories in the Minors. The University of Mississippi product coasted through the South Atlantic League and eventually made a cameo in the FSL, finishing the year as the Minor League ERA leader with a 1.45 mark -- the fourth-best ERA in Minors since 2005. Using his entire repertoire effectively in and around the zone, the No. 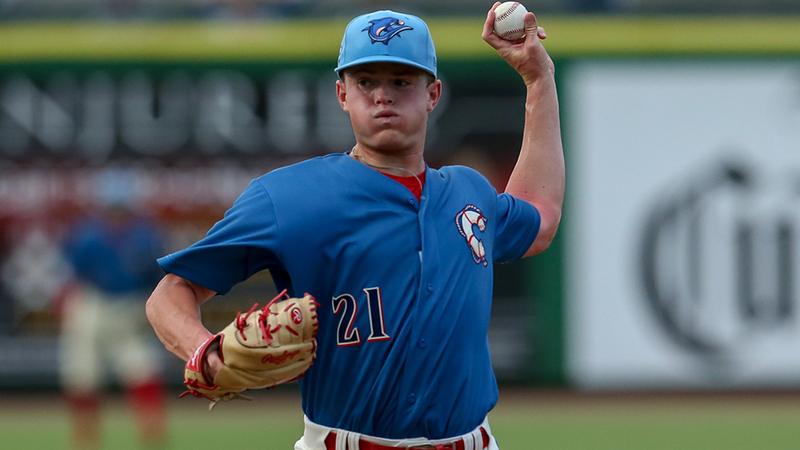 19 Phillies prospect fanned 141 hitters in 124 1/3 innings while posting a 1.01 WHIP. "He throws strikes and he competes," Minniti said. "He goes right after guys, and I think that's something we try to preach to everybody. But he played it out this year and he's a really talented kid. He competes, goes right after guys and throws strikes. ... Anytime you have a chance to develop a starter -- and a left-handed one like that -- it's good for the club." Another later-round pick in 2017, Russ provided plenty of support in the late innings for both Clearwater and Lakewood. In his first 29 appearances in the Sally League, the right-hander went 14-for-15 in save opportunities while fanning 42 over 32 frames. After a jump to the Threshers, Russ posted nearly identical numbers, saving all 13 of his chances and finishing the season with a 1.68 ERA, 0.92 WHIP and 79 strikeouts in 64 1/3 total innings.